Has anyone heard or been to this place yet? @NotJrvedivici feel like taking one for the team? Great first meal at NETTIES!!! Looking at the drink menu I wonder if they took over the whole space. Not surprised about the portion size. The prices are low so I assumed it was more ‘tapas’ sizing and their drinks prices aren’t listed. I bet the cocktails are $12-15. I do believe that yes, the purchased the entire package, restaurant and liquor license. That’s why they were able to reconstruct the entire place unlike the prior occupants. Yes, I’m getting that information from some posts on a local Facebook group I belong to. Most have been fairly critical of it, however not bashing it just saying the price to portion ratio is rather stingy. Like I said I will give it a try, it’s only 5 mins from my house. 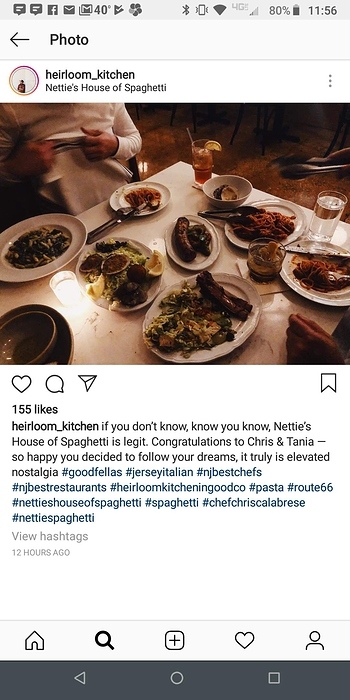 Heirloom Kitchen posted about it on their Instagram story this morning; I had never heard of it. Bingo! This is what prompted me to look it up and see if anyone here has been yet! @CurlzNJ, I also saw Heirloom’s post about it on my Instagram feed. The portion sizes in the photo don’t look small to me. And just to note that @gracieggg included the link to the restaurant’s website in her o.p. What did Heirloom have to say? Is there an affiliation between the two? Here is a screenshot. Sounds like restaurant friends? Although I am fairly illiterate myself, “If you don’t know, know you know” c’mon peeps!!! ya know? Funny thing is, when I told my wife I wanted to go last night she said she passed there on Wednesday night and the parking lot was empty…so she wasn’t that enthused. When I said I “had to go for the Ho’s”…she relented and off to Netties we went. We pulled into the parking lot and it was PACKED, literally only a couple of empty spots. 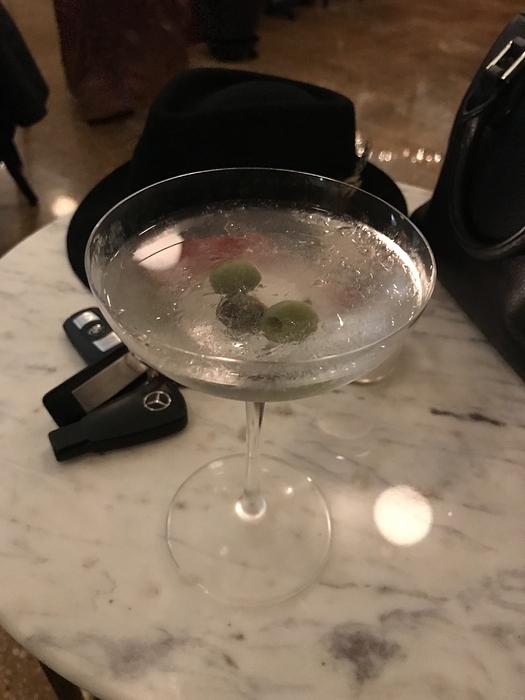 We walked in and obviously the place was packed, we were greeted by a very nice woman who was obviously drawing upon her inner Carrie Bradshaw, she said the wait would be about 15 mins and sent us to the bar. The bar was full, in some places two deep, but they have a set of tables and chairs at the end of the bar so we sat there and a bartender came over and took our drink order. No more than 15 mins later our table/booth was ready. I will say I was surprised by the renovation of the place. From seeing the dumpsters outside and how much was torn down I expected the space to be all new, instead it is just a very well done freshening up of the old space. The same bar is there, with a new top, the floor is the same old cement floor, highly lacquered and finished nicely . Our booth was in the bar area, but the booths are new as is the rest of the seating in the bar area. One nice touch I noticed is the old phone booth is still there, instead of being a functioning pay phone it has be retro fitted to be a cell phone charging station. 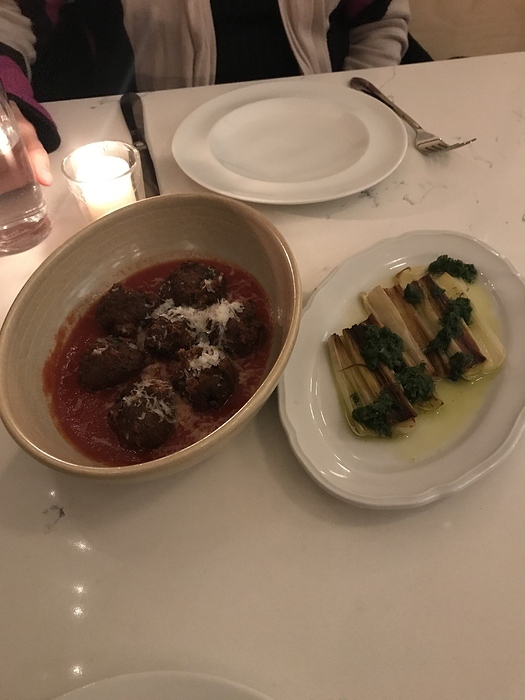 We were greeted by a nice waitress offered bread (we declined) and we placed an order meatballs in red sauce and grilled leeks with pesto to start. Food came after a few minutes and we have some mixed results the menu says: Meatballs - red sauce we received 7 very small meatballs in a red sauce. The meatballs were fried and honestly for their size they were way over cooked/fried. They were hard and nearly flavorless, the red sauce was also very bland. I don’t know if this is the same as their marinara, if it is it’s not very good. The leeks were delicious…the olive oil (I’m not sure if it was flavored or if the pesto just mixed into the oil flavor) was fantastic, almost seemed flavored with a touch of truffle oil. Very rich flavor the pesto and olive oil, I really enjoyed it but could see if it were a full sized portion the flavor profile could become overwhelming. This portion size worked perfectly for this dish. Again we have some mixed results. The baked clams were good, but slightly over cooked. The breadcrumbs were very dry and baked to the shells where it was difficult to chip off the breadcrumbs from the shell. Flavor was good, but too much waste. The broccoli rabe was chopped way too much, I love boccoli rabe but I really didn’t like this broccoli rabe. Although the menu does say served with “calabrian chili” the peppers are served on the very bottom of the bowl, it’s not visible and there was a slight heat profile to the broccoli rabe, so you had no idea there was a ball of chili peppers on the bottom of the pile. With the broccoli chopped as much as it was you just assumed it was mixed into the broccoli already, well when we finished the first half we hit the mother load of the calabrian chili and at that point it overwhelmed the dish. Overall this was the big loser of the night…I just don’t like any aspect of it. The spaghetti carbonara was the hit of the night. Thank God the actual spaghetti dish was the highlight of the meal. The pasta was PERFECT al’ dente’ (an art that is rarely executed properly) and the pork was delicious with the egg yolk, I could have eaten 4 orders of this. BIG miscue, while the service was over-all very good we were never offered additional cheese. This carbonara was fantastic but for me some additional cheese could have made it sooooo much better. I would have thought a spaghetti place would have some cheese and maybe hot peppers on the table, or at least have a buser walking around with cheese and fresh ground pepper, both would have been welcomed on several of the dishes. I looked around and never saw cheese or pepper being offered to any tables and for the moment I wanted it I didn’t feel like waiting and flagging someone down to get it. The only big miscue of service all night and something I felt should be no brainer for a spaghetti restaurant. Reconstructing the food portion of our check it would have been $ 58. 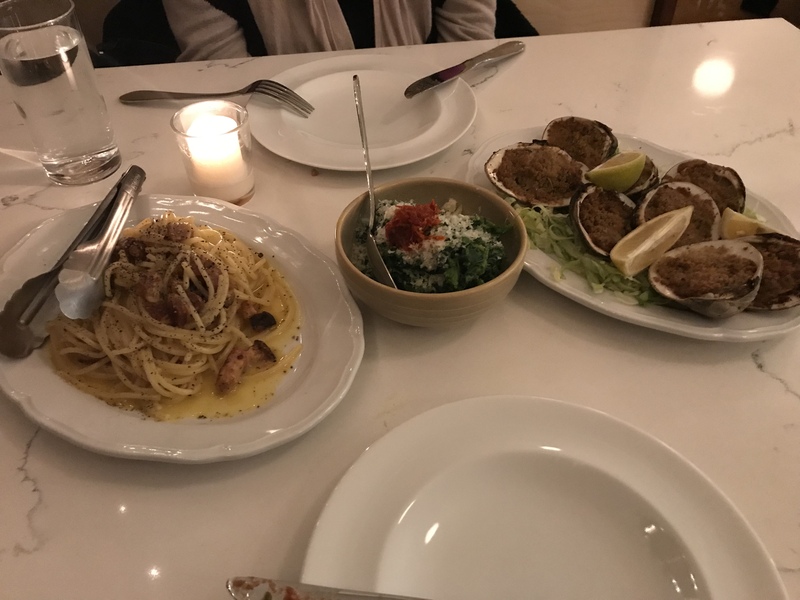 (pre-tax/tip) for what we ordered so @ $ 29 pp I can’t find fault with the price per portion as I had read others complain about. I mean yes I did leave a little hungry and did snack later but it’s not a total rip off which was the impression I had going into it. Although my earlier Carrie Bradshaw comment was a bit of a “jab” at the hostess in her flowing silk dress and Jimmy Choo’s (I really don’t know what Jimmy Choo’s shoes look like I just know it’s a fancy phrase, could have been payless for all I know) - she did work the room, she checked on our table twice and even cleared dishes on her second visit. Kudos for rolling up those silk sleeves and doing the work that needs to be done, giving credit where it’s due. 15 - 20 years ago the current CJ Mc’loones was a place called Brix 516 which was a very “hip-tapas” place and similar to this I had mixed experiences there. At first they were packed, but the novelty seemed to wear off and I don’t think Brix lasted 2 years. I have the same sinking feeling in my gut about this place, I’m just not sure there is enough once the novelty wears off to keep bringing people back. Personally for as close as this is for me it could become a real hangout, but it won’t. First, there is a very “hipster” feel to the place, way to many bearded men in their early 30’s with Ralph Luaren flannel shirts on. Also, I don’t want to go somewhere that I have to order 4 orders of something I like. If this was in downtown Red Bank or Asbury Park where you have a lot of foot traffic I would say their chances would be substantially better than where they are at this “destination” location…hey I could be wrong. Thanks for the detailed report! Taking one for the team, indeed! Frankly, your experience with the food doesn’t surprise me. While you did have a few hits, overall, this place sounds just like the myriad mediocre at best Italian-American restaurants that dot the culinary landscape around here. I appreciate you (and Mrs. @NotJrvedivici) taking one for the HO’s. I would like to try it eventually but not in a huge hurry. I have plenty of flannel and my husband is sporting his winter beard so we will fit right in!